Lee successfully completed his basic vehicle mechanics apprenticeship with Mercedes Benz in 2008. After gaining an NVQ level 3 in HGV repair and maintenance, he worked on a variety of equipment ranging from 7.5ton to HGV articulated trucks, covering all areas of hydraulic and pneumatic air systems. As an apprentice, Lee worked his way up in Mercedes to junior technician, completing 2 years before leaving to work at Cardiff DAF Trucks HGV Dealer. As an established engineer, the opportunity came for Lee to change roles to become a mobile engineer working with Specialist Fleet Solutions. As a mobile engineer his responsibilities grew to servicing and maintaining 130 generating sets, various pieces of plant equipment, SUV and light trucks. This role allowed him to gain experience in liaising with a large customer audience and in providing technical advice on parts and labour. During his time as a mobile engineer, Lee has gained a vast experience working on both diesel and petrol engines, pneumatic and hydraulic systems on a wide variety of equipment types. Since joining Cardiff Diesel Services, Lee has further progressed his engineering skill set. 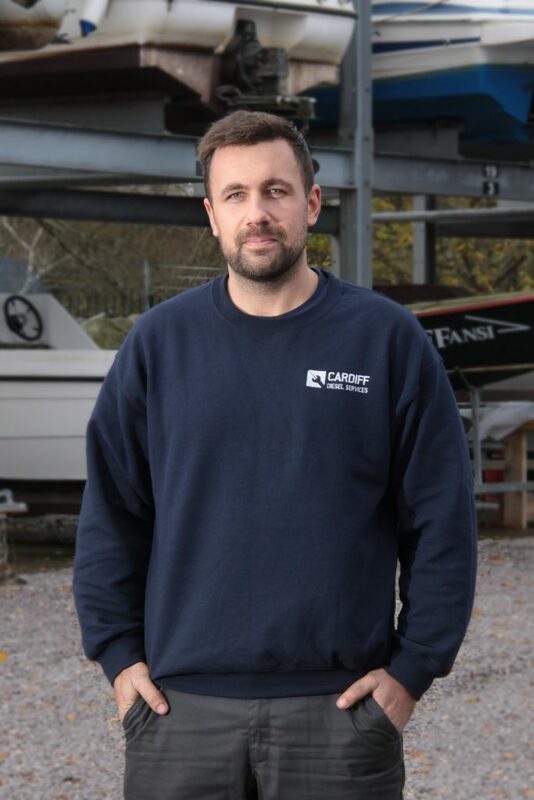 He has enjoyed the new challenge of working with marine diesel engines as well as some of Cardiff’s finest standby diesel generators for companies such as Welsh Water and Cardiff NHS. Lee’s role within the company, working as a mobile engineer with our vast client base, sees him engaging with a wide variety of estate managers and field service engineers. Lee has quickly integrated himself within the team and contributes to the 24hr emergency breakdown service that we provide to all our customers. He enjoys working with new and interesting people and the challenges that his position brings him.